Conviction: Who is My Advocate? 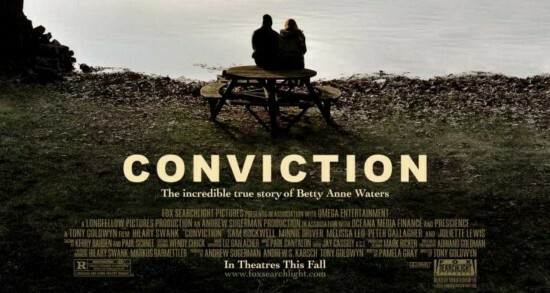 This past week, my wife and I were finally able to check out “Conviction,” a movie that came out in the fall and is now out on DVD, starring Hilary Swank (Amelia, Million Dollar Baby) and Sam Rockwell (awesome in Iron Man 2). I’m not sure why I waited so long to give this movie a shot, but I was not disappointed. This film would have made my top 7 for 2010 had I seen it when it came out. Why? Betty Anne Waters’ single-mindedness and unrelenting fight for her brother brought out a neglected piece of the gospel for me. Betty sacrifices everything for her brother in this movie. He gets convicted of first degree murder and sentenced to life in prison and Betty works over 18 years to get him released and to prove his innocence. She burns down her marriage, does not prioritize her boys, views her money as completely expendable, and counts her own life as practically nothing. Is this a good example? Probably not, even if her husband should have been more supportive, but it’s not like she makes these choices for her own good. Getting her brother out of prison becomes the main idol in her life and everything else gives way. I didn’t like what she sacrificed but the example is pretty amazing and causes me to question what I would do that for. Would I yield anything for Jesus? What would I move hell and high water for? Most of time: my own comfort, not for others. Critics hammered this movie saying it’s move manipulative and not as compelling as it should have been but I disagree. The emotion, honestly, is not nearly as powerful as it should be. The truth is unbelievable. I think critics just can’t comprehend that this story is actually true. Betty’s brother, Kenny (Rockwell), is not a good guy. He is a wild card and prone to anger and impulsiveness. The film tries to give some background on this in showing their upbringing, but it doesn’t change the fact that Kenny is not exactly someone you’d be quick to stand up for. It doesn’t matter. Betty is so vehemently for him that when anyone even remotely questions his innocence she boils to a rage and with many colorful words defends him and kicks them out of her presence, even if that person questioning his innocence is her one and only friend. She fights for him way beyond what he deserves. She gives up a huge chunk of her own life just working for his release. She will do anything to find his innocence and get him out. She stands up for him even when he starts giving up. She is unstoppable. About midway through the movie, I agreed with her husband and her kids, I was practically annoyed with how she didn’t care about anything else. Yes, it’s an injustice, but move on, there’s nothing you can do! Give up! Of course, she doesn’t. By the end, however, her heart and efforts crushed me. She was her brother’s living advocate and defense even when nobody else cared. That is exactly what Jesus is for us. Even now, he lives to be our defense and advocate. He fights for us. He will not hear a bad word about his children. He rebukes Satan’s accusations about us. Are we deserving? Are we worthy of such an advocate? Not in the least. Jesus is not ashamed to call us brothers and he stands up for us in spite of our worst sin and crimes. I think I forget this a lot. I know I’m forgiven but do I trust in Jesus as my risen and active advocate? Jesus is not dead anymore but risen. One of my pastors was extremely helpful in walking through the importance of that this past Sunday. He is risen and he lives to intercede for us. Conviction is worth watching for the build to the climax and emotional ending. Let yourself be “manipulated” by this film and then realize that Jesus is all that and more for you if you would let him. The language is pretty foul, very raw and fitting, but very consistent and harsh throughout – be aware and stay away if you’re sensitive to this.